Spending a quiet St. Patrick’s Day with my parents and, as many of us do at a certain age, shamelessly rifling their old personal documents, I came across this item of interest. It is my father’s Pioneer Pledge, his oath at the age of sixteen to “abstain for life,” albeit with some language about “reparations” that may or may not apply to future “sins of intemperance” as well as past ones. 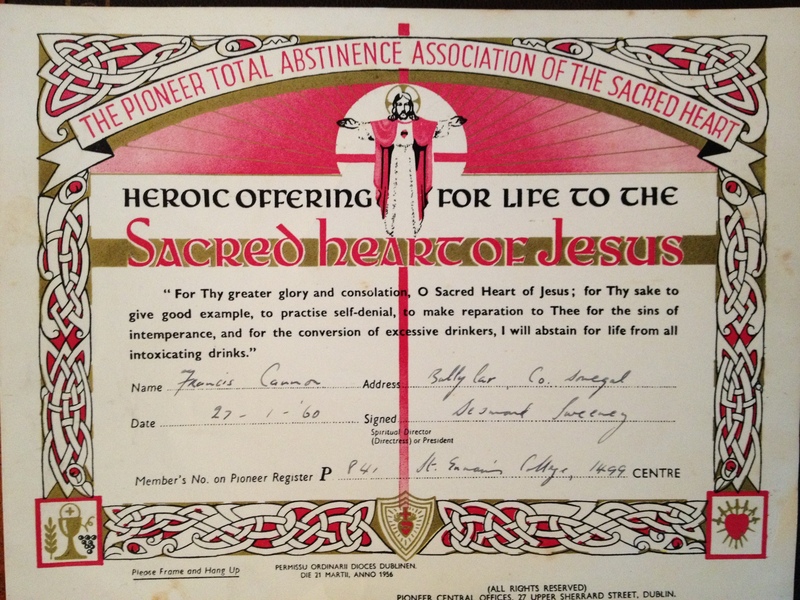 He took it in 1960, near the historical peak of membership in the Pioneer Total Abstinence Association of the Sacred Heart, the movement founded in 1898 by the Jesuit priest James A. Cullen. The Pioneer movement’s growth early in the century was spurred by the recruitment of policemen and other prominent public figures. Ultimately it worked its way into and became most closely associated with the Catholic sacrament of confirmation, a social initiation into pre-adulthood as well as a religious seal. But, as has been the case in many societies, the first unsupervised drink was also a rite of passage. 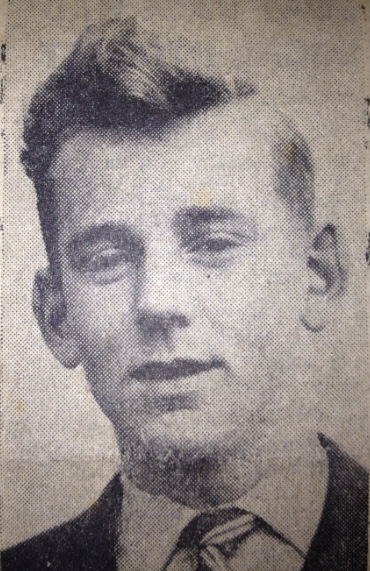 As Mum attested this weekend, the night of what was actually called “Breaking the Pledge” was a highly anticipated event in the lives of many young Irish people in the 50s and 60s. Does this look like a youth embarking on a life of Total Abstinence? The Pioneers are alive and well, albeit with their influence greatly reduced, and the young person’s membership, requiring a pledge only to abstain until the age of 18, is much more common. Indeed, since Father Mathew’s time, the plausibility of the Catholic abstinence pledge has been defended as “not a vow but a simple resolution.” Still, with their powerful language and dramatic, nationalistic imagery, one wonders about a document and an act that initiated a country’s rising generation into adulthood dedicated to the willful violation of a solemn oath. One wonders about the role this kind of unreal language played in a generation that struggled so mightily to come to terms with visible facts of exploitation, abuse, and corruption. No surprise that the go-to history of the Pioneer movement is titled “A Nation of Extremes.” As for the signer of the above document (pictured here around that time), though he never became a dedicated tippler, Thanks be to God, his Pledge was indeed short-lived. Eoin, thanks for sharing this! The topic came up at one of our family get-togethers a few months back. My great-grandmother made my uncle sign the pledge as a *six-year old* (this would have been the late 1950s, I think). He wished he still had the document, which would have functioned really well today as ironic decor in his SanFran-area home. Thanks Claire. Some thoughts on abstemious six year-olds! First, apparently it was common in Fr. Mathew’s 19th-c. movement for mothers to bring toddlers and even babies to “repeat” the pledge with his hand upon them. It was more a power-of-protection spell than what we think of as a conscious vow — and I think that this is how all such children’s pledges operate for parents, even to this day. It’s still pretty common for DARE and similar programs to get children to make anti-drug pledges. I don’t know if their efficacy has been measured, but they seem fairly futile. I know my thoughts about drugs — not to mention much of my sense of self and social life! — changed dramatically between the ages of 12 and 15. Interesting connection! I (very vaguely) recall attending those DARE assemblies–I suppose any paperwork associated with them was much less memorable than the Pioneer Pledge! I don’t know if Ferriter goes into it in his book, but also in the Irish nation of extremes, as a parallel response to Cullen’s Roman Catholic Pioneer movement, was Patterson’s Presbyterian Catch-My-Pal movement that was more or less a flash-in-the-pan from 1909-12 that captured hundreds of thousands for at least a period of time. The Catch-My-Pal pledge appears to be straight from the WCTU. Wow! Now that’s comprehensive. Thank some kind pledge-writer for that thoughtful “…period of [time].” loophole. Actually, I can imagine how the period of time loophole works both ways. It makes it seem more manageable to the taker, and gives more serviceability to the church. If it were forever, then after a while, the pledgers wouldn’t really need any ongoing services.